The site, which was uncovered by Dr. Eilat Mazar of the Institute of Archaelogy of the Hebrew University and was prepared for public display and access by the Israel Antiquities Authority Conservation Department, will be opened to visitors. In a festive ceremony to be held Today – Tuesday, June 21, 2011, the Ophel City Wall site, a complex of buildings uncovered along the route of the fortifications from the First Temple period (tenth-sixth centuries BCE), and the display of the earliest written document ever uncovered in Jerusalem will be inaugurated. 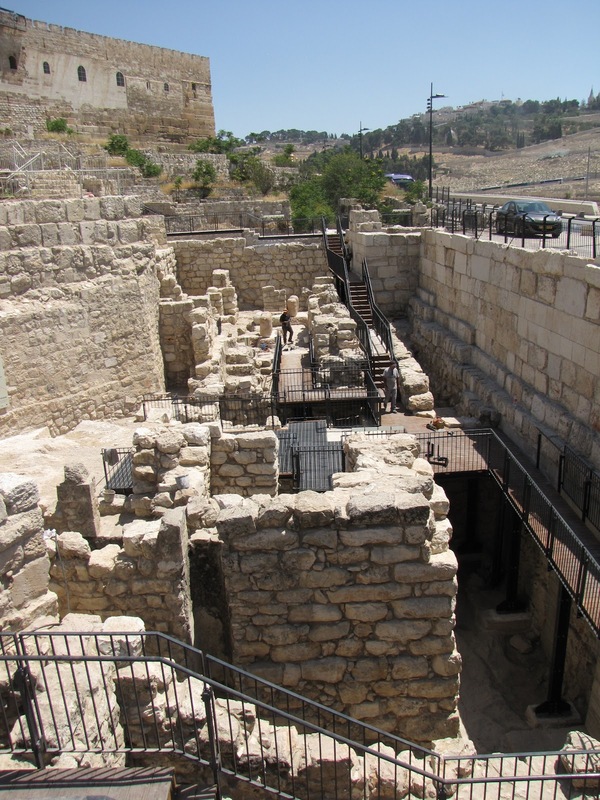 The opening of the site, located in the Walls Around Jerusalem National Park, and the exhibit in the Davidson Center are made possible through the generous donation by Daniel Mintz and Meredith Berkman. The ceremony will be attended by Mayor Nir Barkat, Israel Antiquities Authority director Shuka Dorfman, Nature and Parks Authority deputy director general Modi Oron, East Jerusalem Development Company director Gideon Shamir and Dr. Eilat Mazar of the Institute of Archaeology of the Hebrew University of Jerusalem. Oh When the Ants Go Marching In… ?! This is the kind of thing that makes me so glad that I opted for vegetarianism! Rome – The Vatican is lending iPods to pilgrims in a pilot program aimed at coupling ancient basilicas with modern technology to lower the noise level from tour guide chatter. From a tiny booth in the back of St. John in Lateran, the Vatican has been quietly asking tourists if they want to tour Rome’s oldest basilica with an iPod in hand loaded with an app to make accessing the place’s art, architecture and Christian history user friendly. The Vatican will formally unveil the experiment on Wednesday. Tourists from around the world were exploring the cavernous basilica with specially adapted iPods in hand Tuesday. There’s no charge, although users must leave a document as security. The experiment runs through December. There could hardly be a plant more important or more associated with spiritual themes in Jerusalem than the olive. If you encounter Arab children in tourist spots in Jerusalem, one will almost certainly give you an olive branch and request a donation. The ancient symbol of peace also symbolizes many other things in Israel. They say you plant an olive tree for your grandchildren, not for yourself. This is because a tree requires twenty years to mature. The hard wood of an olive makes for a long-lived and resilient fruit-bearing tree. In Jewish scripture, the olive represents the holiness and purity of worship, as it says in Exodus 27:20, “You shall command the people of Israel that they bring to you pure beaten olive oil for the light, that a lamp may be set up to burn continually.” And it represents the place of anguished prayer in Gethsemane the night before Yeshua (Jesus) was crucified: “When they had sung a hymn, they went out to the Mount of Olives” (Mark 14:26). In the last days, we read that God will make Israel as beautiful as an olive tree (Hosea 14:6). We often think schism is caused by heresy, but often it is the case that a heresy is merely propped up as an excuse for the schism, when the real motives lie elsewhere. Behind every heresy lies some kind of social conflict, and it is only by the resolution of this conflict that unity can be restored. He gives as an example the Armenian schism at the time of the Ecumenical Council of Chalcedon. Yet even from the beginning it is obvious that the passions which filled the steets of Alexandria with tumult and bloodshed and set bishops fighting like wild animals were not inspired by a pure desire for theological truth or even by purely religious motives of any kind. Dawson goes on to analyze the sociological causes behind schisms, including that of Protestantism in Europe during the time of the Reformation, but I want to focus more specifically on the Orthodox schism. Father Gerard Sheehan issues a statement regarding the case of Father John Corapi. On 16 March 2011, the Bishop of Corpus Christi, Texas, and the SOLT received a complaint against Father John Corapi, SOLT. As is normal procedure and due to the gravity of the accusation alleging conduct not in concert with the priestly state or his promises as a member of an society of apostolic of diocesan right, Father Corapi was suspended from active ministry (put on administrative leave) until such a time that the complaint could be fully investigated and due process given to Father Corapi. In the midst of the investigation, the SOLT received a letter from Father Corapi, dated June 3, 2011, indicating that, because of the physical, emotional and spiritual distress he has endured over the past few years, he could no longer continue to function as a priest or a member of the SOLT. Although the investigation was in progress, the SOLT had not arrived at any conclusion as to the credibility of the allegations under investigation. At the onset, the Bishop of Corpus Christi advised the SOLT to not only proceed with the policies outlined in their own constitution, but also with the proper canonical procedures to determine the credibility of the allegations against Father Corapi. We reiterate that Father Corapi had not been determined guilty of any canonical or civil crimes. If the allegations had been found to be credible, the proper canonical due process would have been offered to Father Corapi, including his right to defense, to know his accuser and the complaint lodged, and a fair canonical trial with the right of recourse to the Holy See. On June 17, 2011, Father John Corapi issued a public statement indicating that he has chosen to cease functioning as a priest and a member of the SOLT. Corapi’s gone rogue I’m afraid. UPDATE: As of 05 July 2011, Fr Gerard Sheehan who is Fr John Corapi’s superior in the Society of Our Lady of the Most Holy Trinity (SOLT), has released a shocking statement. Very distressing indeed.